Outreach and education work have always been important to the quartet and they have become known for their unique workshops and communication skills with young people. The quartet is regularly engaged in various cross-art projects, most notably with Shobana Jeyasingh Dance and with the award winning jazz group ‘Empirical’, with whom they collaborated in the London Jazz Festival and on the group’s 2013 album, ‘Tabula Rasa’. In 2012 the quartet founded Quercus Ensemble, a mixed chamber ensemble based in Northern Ireland. They are currently involved in the ground-breaking Inclusive Creativity project supported by the Gulbenkian and PRS Foundation which has resulted in a tour of a new work for string quartet and Acoustronic, a group of young disabled musicians using new music technology. Formed at the Royal Northern College of Music, the Benyounes Quartet subsequently studied with Professor Gabor Takacs–Nagy at the Haute École de Musique in Geneva. They have also worked closely with Peter Cropper, Quatuor Ebène, Eberhard Feltz, Andràs Keller and David Waterman, at centres such as Pro Quartet, Aldeburgh and IMS Prussia Cove. 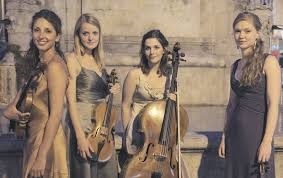 The quartet held the Richard Carne Junior Fellowship at Trinity Laban Conservatoire of Music and Dance (2011-13) and is currently resident at Bangor University. Their debut recording of Mozart Piano Concertos with pianist Jeremy Young was released on Meridian Records to critical acclaim. They featured on Champs Hill Records complete works for string quartet by Mendelssohn (BBC Magazine’s critics choice 2014) and their forthcoming disc for Champs Hill will be released Summer 2018.